Although not strictly 'pottery' (from the fired-clay point of view), this striking ceramic and stone resin piece (one of several ceramic figurines in our shop) is nonetheless a stunning example of Spanish ceramic art. It is made in the northeast of Spain, famous for its Mediterranean seafronts along the Costa Brava and Costa Dorada, and of course for its culture and art. (Cataluña, or Catalonia was the birthplace of painter Salvador Dalí and Antoni Gaudi). It is said that a Gecko can bring good fortune, protection from adversity, and a fun-filled passion for life. This ceramic piece is intricately finished in the Catalan modernism style . . a form of architectural art seen typically in Barcelona's Parc Guell. Each piece is hand-painted in dazzling colours to produce a beautiful and uniquely-crafted figurine that would make a delightful present . . and a unique gift from Spain. Description: This lovely Mediterranean blue Gecko / salamander figurine measures approx 16cms (6.3ins) long by 9cms (3.5ins) at its widest part. It has a hanging arrangement on the underside so that it can be wall mounted, or stand alone either in the home or office. The hand-painted, porcelain-like finish is simply stunning in its detail and is an intricate piece of Spanish ceramic art. Because each one is individually painted, each figurine is distinct and so no single one is exactly the same as another (so figures may differ slightly from the photos here). In many cultures, Geckos are said to be lucky (as well as being thought of as guardians) and blessed with a fearless passion for life. So perhaps this Gecko figurine will help protect a friend or loved-one from adversity, and pass on its good luck qualities - and even recall memories of a fun time had on a trip to the Mediterreanean or other warmer climes. 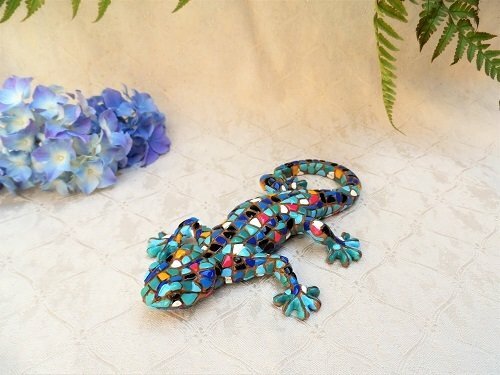 So this Gecko figurine, something special from Spain, would make a truly unique gift for a housewarming / new home present, a birthday, or perhaps for luck to achieve a goal - like starting something new. (Or even for a person that just loves geckos!) It is bound to attract admiring comments. Please Note: To preserve its fine features, it is best to keep this figurine indoors, or at least under-cover if outside. A traditional product of Spain and a delightful piece of Spanish ceramic art. Ships gift-wrapped in a stylish and substantial presentation box. If you wish, we can print a personal message on your behalf on a gift card and include it in the presentation box. We can also ship direct to your friends / loved-ones' address if you want. This is all INCLUDED in the price.